I just got in from seeing the Norman Rockwell exhibit at the Smithsonian Museum of American Art. It was fantastic. All of the paintings and drawings are from the collections of Steven Spielberg and George Lukas. I grew up loving Rockwell even when the art world told me he was not a serious artist, just an illustrator. No one on this planet has ever held a candle to him when it comes to conveying an expression on a face and telling a story in one picture. I would rather own one drawing by Rockwell, than 100 paintings by Picasso or any other abstract expressionist artist. From there, we drove to the Strathmore Mansion to see the Miniture Painters, Sculptors and Gravers Society of Wash DC annual international show. Another fantastic show. A perfect Art Day! This is day two. I am very happy with the way John Adams is coming along. I have darkened the background more....will probably take it down much further in value in the next painting session. James Madison is coming along nicely also. Getting the dark values painted in early on, really helps me to see where to go with the shadows on their faces. Until I have the darkest darks in, I am afraid of taking the facial shadows too far for fear of getting the values wrong. These are photos of day one of the Presidents. 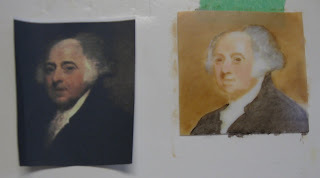 I did not get very far with Jamse Madison this day, but am very happy with John Adams and President Monroe. I will work on them today and post results tomorrow. I wish you all peace, family and modest prosperity. Obscene prosperity is now out of fashion thanks to the banking industry and Wall Street. I recently sold another of my George Washington miniatures at the MPSGS show at Strathmore Mansion. It sold for $500. I think I may have found my niche in the art world. I love painting portraits, painting copies of old masters, and now I have found I love painting miniatures. 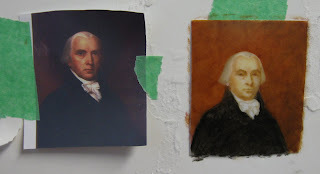 I really enjoy painting these tiny portraits and have decided to paint all the presidents and a few of my favorite patriots. 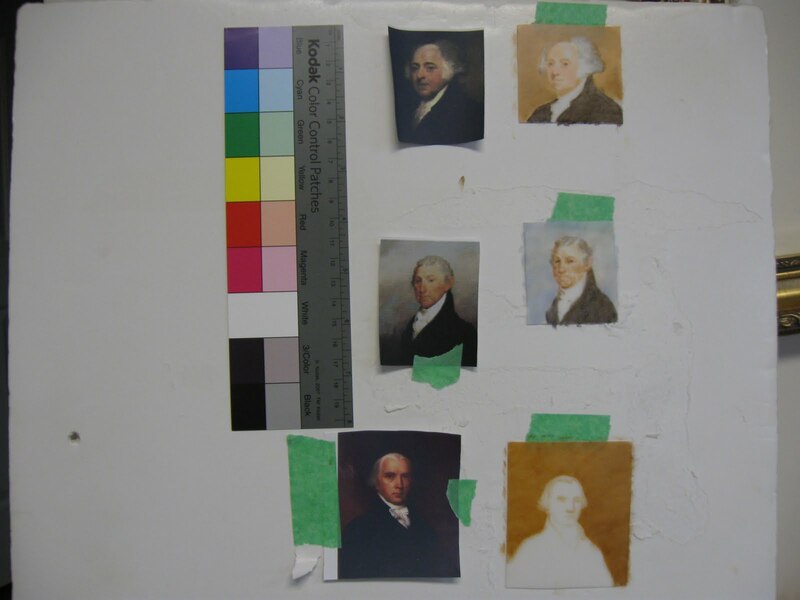 This is my next three portraits from top to bottom, John Adams, James Monroe, and James Madison. I have laid a Kodak color seperation guide beside them thinking I would use them later in a publication. 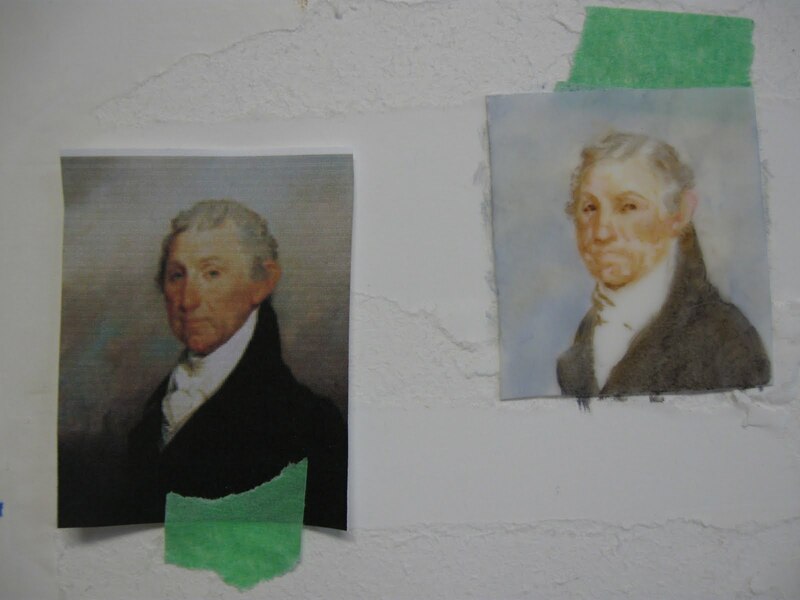 On the left is a tiny photo of the president and on the right is my humble beginning. I don't trace. I start with a very pale sketch using the sight size method. I then scumble in a background, soften it with a mop type brush and then do the same with all the large mass areas. 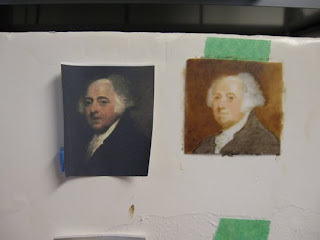 I do this also on the flesh in the dark areas and leave the light areas untouched, soften these areas and then leave the painting to dry up for a day or two before proceding. This photo is at the end of the first painting day. Adams and Monroe are further along than Madison on this first day's work. 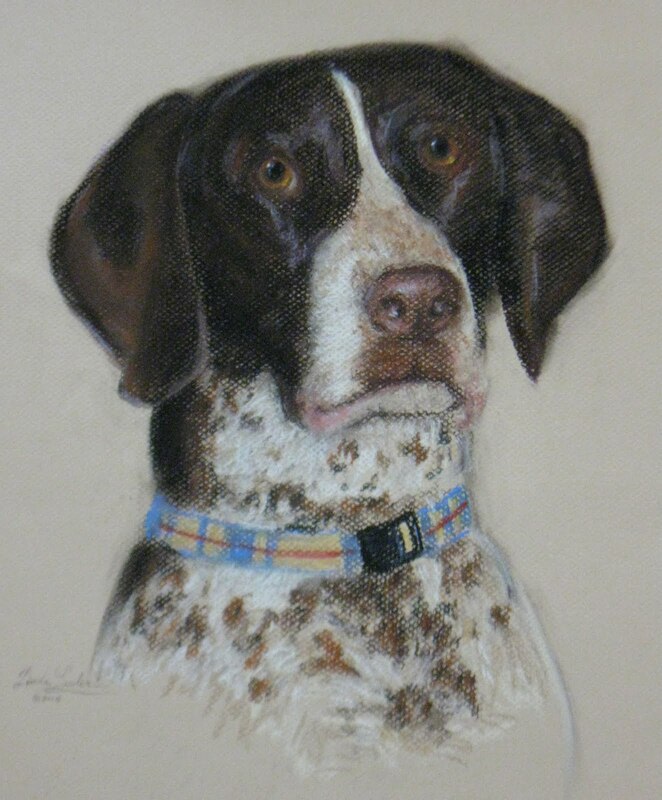 I received the letter below, from the owner of the yellow lab I had just finished a pastel for. This is the reason I paint. Yes the money I earn is nice and keeps the rent paid, but the real paycheck is the feeling I get when I deliver a piece of art and hear the following. "Linda, Wanted to let you know that the picture arrived yesterday at my mom's house. I am so happy with how it turned out....it looks just like him! The woman at the framing store thought it was beautiful, too. She asked where I found the artist. I'm disappointed that it won't be framed in time for Christmas, but that's okay...it just makes Christmas last a little longer. And, I was too afraid not to put it in a frame right away....I didn't want to ruin it by rolling and unrolling it too often. Thank you so much for your quick turn around and endless patience with all my questions. I am so pleased and can't wait to see it once it's framed! Hope you have a Merry Christmas and your husband makes a speedy recovery from his surgery." I went to the big gem and bead show at the Chantilly Expo Center on Monday afternoon. I had never been before and had no idea what to expect. It was amazing! There were jewelers, gemologists, every kind of bead you can image and wall to wall vendors of every possible thing a jewelry maker could want. I was in beadaholic heaven. My poor husband eventually had to go and sit in the snack bar for two hours. He is now walking with a cane after having hip replacement surgery and it was too much for him. I was broke after three hours and my eyes were popping out of my skull from bead overload. I hope to go again next year and will be better prepared with better shoes and a fatter wallet. 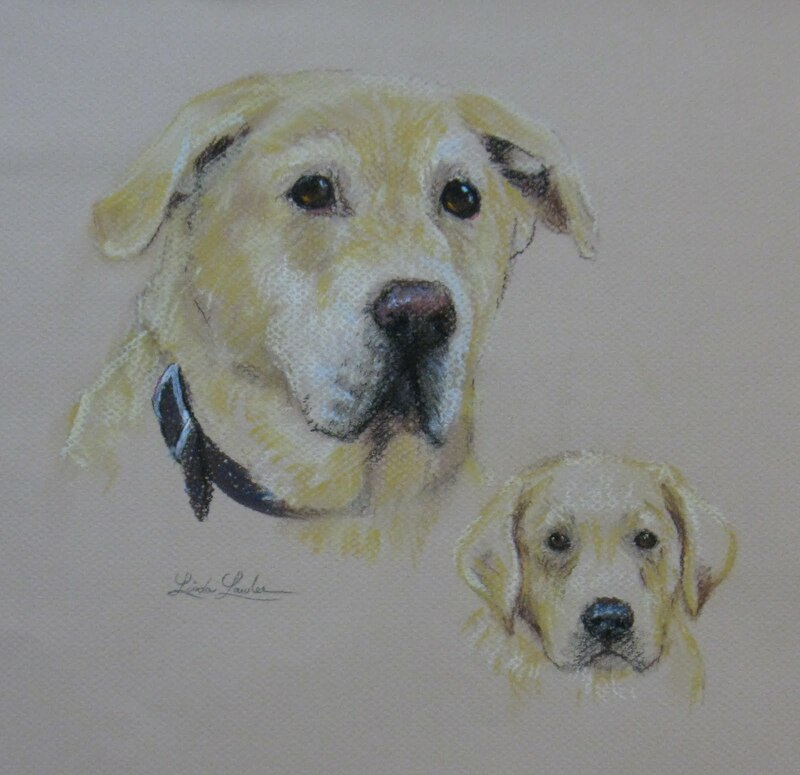 This double portrait of a lab as a puppy and older dog is now on it's way to Cleveland for Christmas. 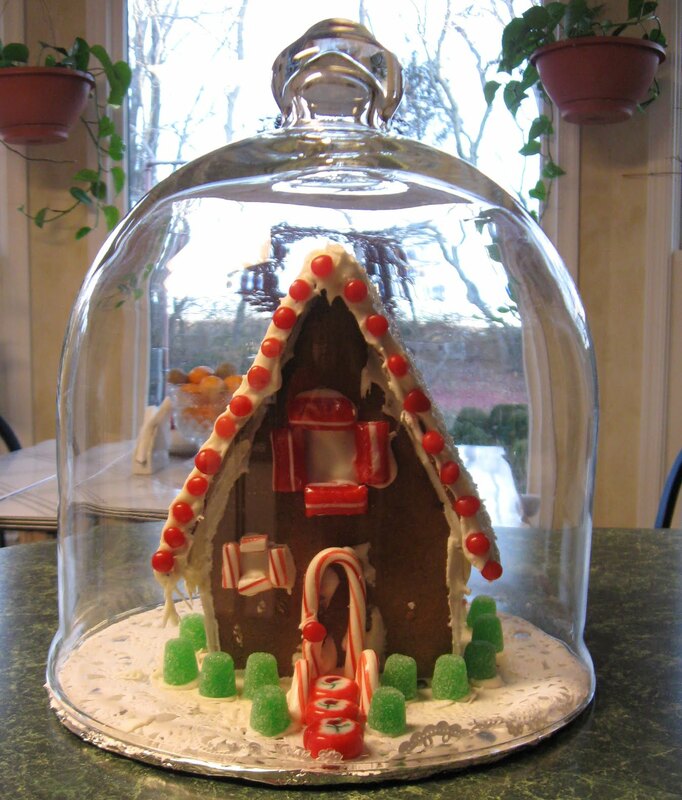 I spent yesterday creating my gingerbread house with good friends Jeanne and Monica. Jeanne hosted the art extravaganza, provided the pre baked and assembled houses for us to decorate, and the luncheon at her home in Manassas. Wine flowed as well as talk about our artwork and careers. Scrumpteous curried chicken salad on greens with assorted cheeses and crackers was enjoyed. Monica shared with us a wonderful sunset at the ocean she has just completed. It was a perfect art day! Betsy has such beautiful and soulfull eyes. She is the companion piece to Belle. I used pastels on Canson paper for the portraits of the two dogs. In my oil portraits I try to be sure there are lots of soft edges, so the eye does not try to focus every area at the same time. I did a deliberate smudging of edges on the outside edges of the dog and I left the sharp edges around the eyes and nose so that your eye will automatically land on these spots. Ok, I realize this is not art related, but I could not resist posting this picture. 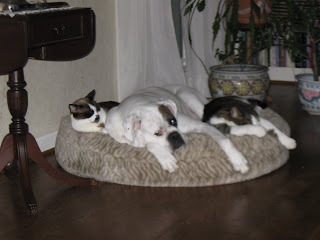 This is Molly and two of her five cats. We don't own these cats, Molly our boxer does. We recently had to purchase two more dog beds, so that Molly could find a place to sleep at night. Most of the time, all of the beds have one or two cats on them. Molly is so gentle, she won't bark at the cats. She just stands by the beds and wimpers for the cats to move. Of course, being cats, they won't move. I end up removing a cat or two so that dear sweet gentle Molly can lay down. The big cat on the right was a ferel cat that we inadvertantly captured in a Hav A Hart trap years ago. Once we had him, we neutered him, cleaned him up, got his shots and then released him. But, he had had a taste of civilization and was hooked. He began showing up for meals and sitting in the living room window watching us. After about six months, I was able to pet him, and 9 months later he was coming inside to look around. We have now had him for 5 years. We decided that since a car has four tires and a spare, we would call him Spare Kitty, since we already had four cats. This is the little bluebird miniature I had started some time back and abandoned it when my very observant husband informed me that the birds were not 1/6th lifesize. This means that they are not true miniatures in the strictest sense. I came back to the painting and finished it just before my husband's surgery. 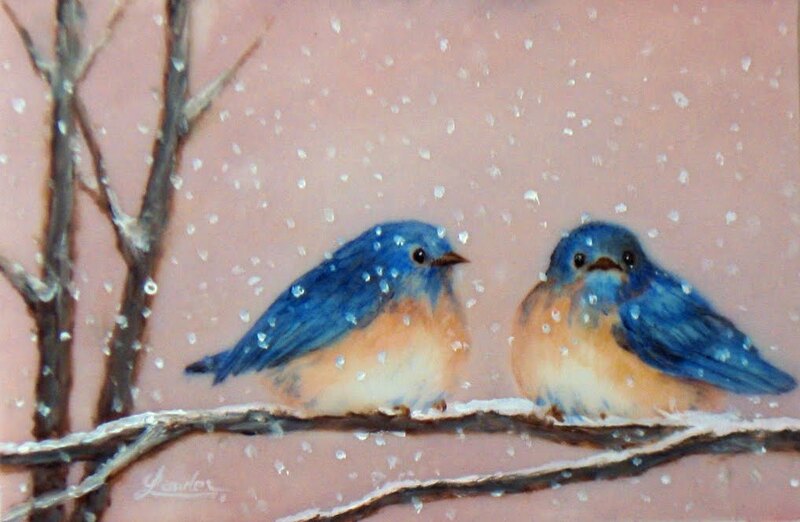 They are painted on a 2 1/4 x 3 inches piece of ivorine. I think they have a cutesy appeal to them, unfortunately I was going for very realistic look. Even so, they will make an adorable greeting card down the road.